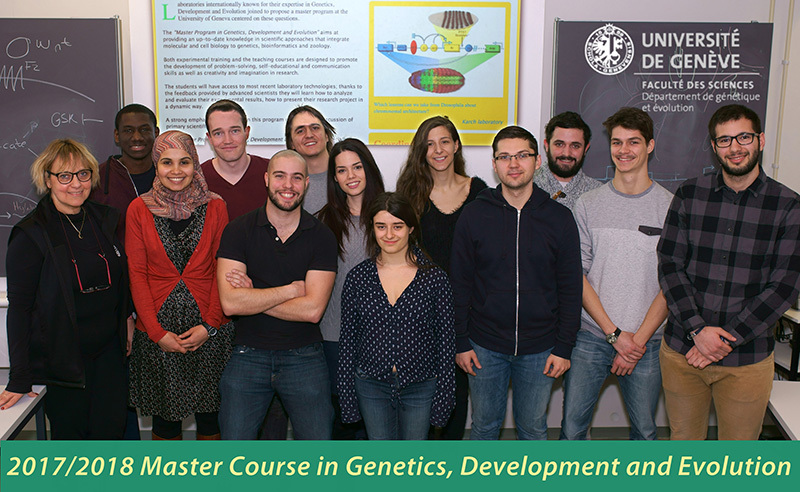 The Master Program in Genetics, Development and Evolution aims at providing an up-to-date knowledge in scientific approaches that integrate molecular and cell biology to genetics, bioinformatics and zoology. The students will have access to most recent laboratory technologies; thanks to the feedback provided by advanced scientists they will learn how to analyze and evaluate their experimental results, how to present their research project in a dynamic way. A strong emphasis is also given in this program on the critical discussion of primary scientific literature. 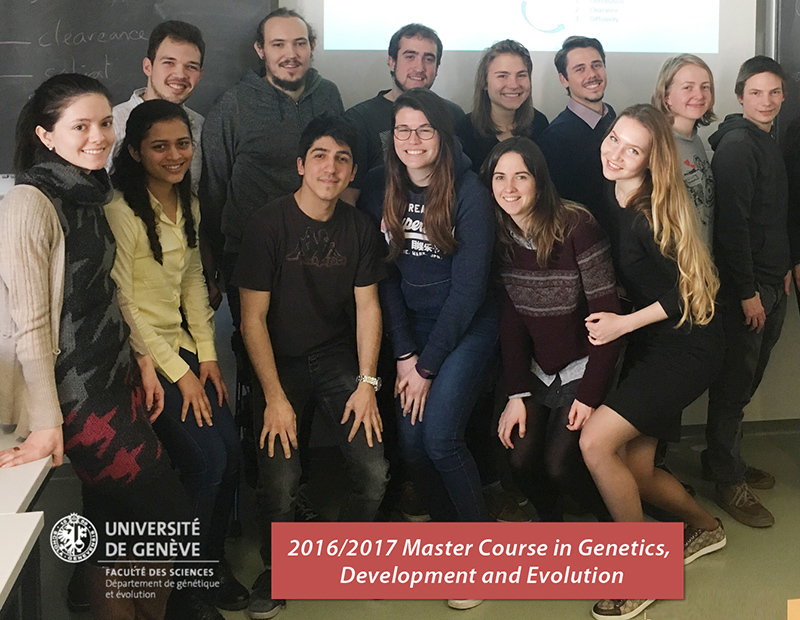 The Master Program in Genetics, Development and Evolution is specially appropriate for students who wish to continue their studies in the frame of the University of Geneva International PhD program in Life Sciences or anticipate careers in the health and life sciences industry, in clinical research laboratories, in governmental health offices, in scientific journalism, or in scientific museums. The department also proposes a Master in Biology option Biodiversity and Systematics, in collaboration with the Unit of Microbiology, the Museum of Natural History and the Conservatory and Botanical Garden of the City of Geneva. The aim of this master program is to provide a solid education to undertake a master research in various fields of evolutionary sciences, such as the study of biodiversity, phylogeny, evolutionary genetics, population genetics, biogeography and taxonomy. A wide range of taxonomic groups are studied, from bacteria and protists to plants and animals, including humans. Learn to master (or develop) bioinformatic and biostatistic tools to analyse data from various biological fields of investigation (population genetics, genomics, proteomics, evolution, etc.). As well as learning how to use these tools in a specific research theme of one of these fields. This type of master gives the possibility to integrate any field of biology without the imposition of a particular specialization. It allows the student either to choose his/her own specialization or to follow a broad orientation. The free orientation still provides all openings after the master, including the PhD in Science. In agreement with the master work adviser, all courses (30 ECTS) can be chosen among those proposed in the Guide for Students. Other courses (outside the Section or outside the University of Geneva) can also be chosen in agreement with the Chair of the Section. The master work (60 ECTS) can be performed in any laboratory of the Biology Section including laboratories not proposed as host laboratories for specific master options, as well as other laboratories outside the Section (e.g. laboratories of the Faculty of Medicine). Note that a same research topic can be chosen for a master with free option or for a master with specialized option, depending on the recommendation or agreement of the master advisor. The Faculty of Sciences of the University of Geneva together with the Novimmune company offers an outstanding research environment for studies in Life Sciences. The departments of Genetics & Evolution, Biochemistry, Cell Biology, Molecular Biology, Plant Biology, Organic Chemistry and Novimmune have united their efforts to provide an extensive educational background and possibilities in research that are necessary to meet the scientific challenges of the future.